The General Council of Notaries in Spain published data this week showing that US, Chinese and Russian buyers were among the most active foreign buyers in Spain during Q1 2014 with buying activity from each nationality increasing by 88.9%, 83.1% and 62.6% respectively, compared with 2013. 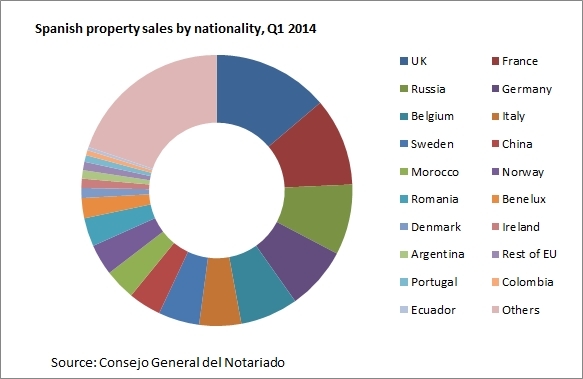 19.4% of all Spanish property sales in the first quarter of the year were to foreign buyers, 47.9% being non-residents. Andalucia saw one of the strongest increases in property sales, increasing by 32.5% with many buyers being attracted to the cosmopolitan town of Marbella and its close proximity to Malaga airport and the tax haven of Gibraltar. These are the first signs that non-EU buyers are being attracted to purchase by Spain's 'Golden Visa' scheme which provides residency visas to non-EU nationals seeking real estate investment opportunities in the country. Property purchases in excess of €500,000 qualify investors for visas that allow freedom of travel throughout the 26 Schengen countries together with educational opportunities for investors' families. Foreign property purchases in Spain are steadily increasing with British buyers now accounting for 13.8% of all foreign purchases, French buyers 10.5%, Russians 8.4%, Germans 7.5% and Belgians 6.9%. According to the Notaries' data, the average price of a property purchased by a foreign buyer continues to fall and currently stands at €1,486/m2, a fall of 3.8% year-on-year. 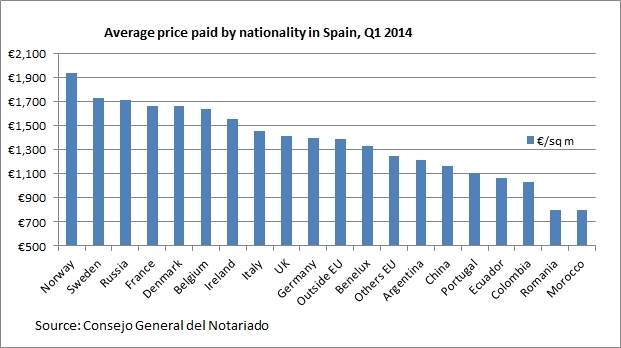 The report also reveals which nationalities pay the highest prices for their Spanish property investments. Norway and Sweden came out on top in Q1 2014, paying an average of €1,935/m2 and €1,732/m2 respectively. Foreign investors are not only being attracted to the market by the promise of a visa. Spanish property valuation firm Tinsa recently published a report showing that the housing market in Spain has entered a period of stability, suggesting that an end to falling prices is now in sight. According to the report, Spanish property prices fell by 4% over the last 12 months which is a far slower rate of decline than was seen last year (6.3%) and the best May figure since 2008. In the first five months of 2014 only 0.9% of the value of real estate has been lost and there has been no variation in the index since January. Prime locations are the focus for most foreign buyers, demonstrated by the fact that there were 36.5% more foreign purchases in Marbella in Q3 2013 than the previous year. Marbella is the most sought-after location in Andalucia and one of the most expensive areas for property in Spain. The same trend is repeated in other prime locations both on the coasts and inland; there is a central hub of buying activity covering a relatively small area while on the periphery and beyond, the market is stagnant. The Notaries reported that 70% of property purchases by foreigners in 2013 were made without a mortgage, indicating the wealth of foreigners in this market. The Golden Visa scheme was introduced by the Spanish government in October 2013 and the Notaries' report shows a significant increase in non-EU buying activity, implying a good response to the residency programme.